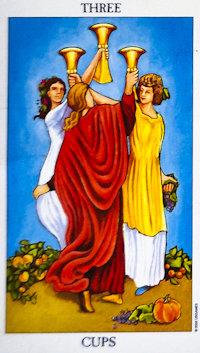 In the Three of Cups, we got just in time for a party or celebration of some sort. Three women dance in a circle and we can see the faces of all but one. Two of them have dressed their hair up with flowers while the other has left her hair flow loose. This lady appears different from the rest. As they dance they are surrounded by the fruits of harvest time. Bunches of grapes, pumpkins and apples lie strewn about the dance floor. This appears to be harvest time or the fruits of their labour and it looks like all the hard work has yielded well. There seems to be an abundance of fruit and vegetables. So much so that the women wear them in their hair and carry them while they dance. The Three of Cups brings celebration, festivity and socialising. This card is strongly feminine, so these women may be enjoying the bride to be’s last night as a single woman. There is a tendency towards excess with the Three of Cups and these women must be careful not to overdo it – Parties and drinking may be a very strong feature in their lives. For the time being, let them enjoy the party and hope they do not feel too hungover in the morning. If you have been searching unsuccessfully for a job or placement then the appearance of the Three of Cups could indicate that you will get several offers all at the one time which you must choose from. With the party aspect of this card, it can highlight working as an Event/Banqueting Manager, Catering, Wedding Coordinator or Entertainer. Celebration, Weddings, Toasts, Friends, Get-Togethers, Reunions, Socializing, Partying, Indulging, Intoxication, Happy Times, Exuberance, Teamwork.